After two full-days of work, we are slightly ahead of schedule. Almost all of the primary poles are now completely framed. But it hasn’t been easy- we had a pretty big learning curve to overcome. The first day of work was somewhat chaotic. Both the environment we are working in and the tools we’re using are a little different from back home. On top of that, this is our first time working together as a team. Anytime you start working with someone new, it takes a little bit of time to find your groove. I think we’ve found ours now. The terrain out here is intense. Even if we had a bucket truck or a digger, there is no way we would be able to use it. We have to rely on manpower alone to do all of the work. Thankfully, the locals have been quick to lend a helping hand. 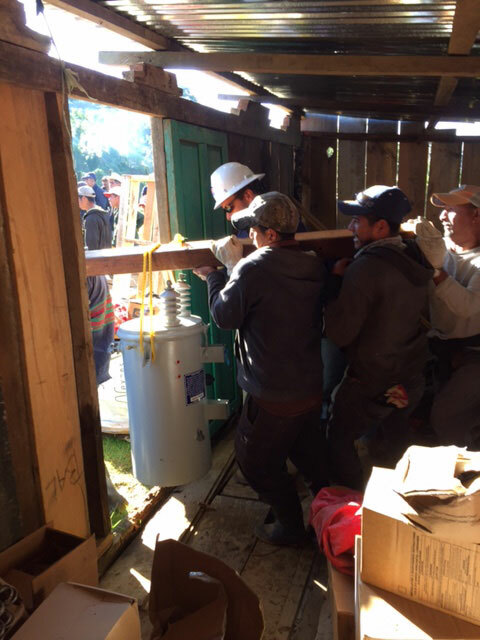 They’ve been working alongside us, moving wire and carrying materials to the poles (pictured). We’re even getting to know a few of them by name. Carlos hung out with us today. He is an older gentleman, about 60, and he is a hoot. He is so happy-go-lucky that everything is funny to him. When your body hurts from climbing all day, having a fun conversation with an appreciative local goes a long way to take your mind off the discomfort, and keep you motivated. We hit it pretty hard the first couple of days, and we are satisfied with the progress we’ve made. The best part about being ahead of schedule is that it means we get to slow down the pace a little bit! – Contributed by Great Lakes Energy lineworker, William L.
How is the humidity down there? Are you able to do any interaction with the villagers and the kids? I’m glad your ahead of schedule and I bet the locals are excited for the day you’re able to turn the lights on for them. What other than the terrain are problems for you? Do you have enough materials? Great job guys… You are an inspiration to the rest of us. It is a pleasure to read your progress updates. It warms my heart that you are willing and able to do this work in Guatemala. God bless you!!!! I totally agree with Judy E’s comments. The daily post cards are such a great way to learn about the world around us and reminds us of our blessings. What a difference your efforts will make in this community and hopefully inspire others.